LONGVIEW, Texas (NEA)-The tall, lanky man walks over to the table, pours himself a cup of lighter fluid and promptly goes up in flames. With a short gust of breath, he blows himself out. Dressed in solid black, a stark contrast to his fair features, he pauses for a drink - of water this time - and slides a cigarette out of a pack. With a sly grin, R.T. Eby admits he doesn't need a light. He says he knows all the fire jokes. He seems to be a relaxed person, casual and talkative. He is as sure of himself in conversation as he apparently is in his work. A mistake in most professions might cost you a job. In Eby's profession, it can cost you your life. He is living proof that he doesn't make mistakes. 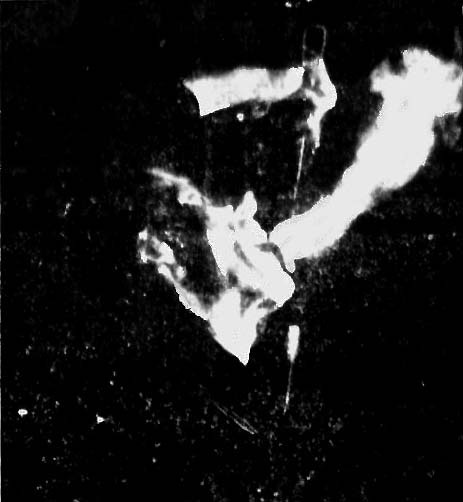 Billed as "The Human Volcano" with Waller International Circus Sideshow, Eby literally bursts into flames while performing. He says he is one of only 12 professional fire-eaters in the country. Immediately he qualifies the term "professional." "I'm not one of these guys who blows a little flame and says, 'Wow, look at that.' I am a showman and I'm very proud of my act." Eby says he is the only professional fire-eater who performs the "Double Volcano," which involves grasping a flaming torch between his teeth and igniting two other torches. If he ever fails at that stunt, he probably won't get a second chance to succeed. "Breathing in kills you," he says matter-of-factly. "The fire singes your lungs." The risks of a bad burn and possible death - are simply part of the job for a fire-eater, he explains. "I'm always getting little burns," he says, pointing to his blistered mouth. "It's part of the business. It;s part of the act. You do it enough and you quit feeling it." But he adds that he does nothing that he cannot control. "You learn to control it and keep burns down to a minimum," he says. Jack Waller, who owns the sideshow, was Eby's "fire mentor." Eby knew Waller personally. The aura of excitement around fire-eaters prompted Eby to ask Waller to teach him the tricks of the trade. "You start out with dry torches and learning the moves, the breathing techniques," Eby explains. "At least half of it is breathing technique, combined with moving the torches." A former journalist, the 32-year-old Eby has an associate degree in journalism from Fresno, Calif., City College and a bachelor of music education degree from the University of Colorado at Denver. "I wouldn't trade it," he says in comparing fire-eating to other professions. "I want to notoriety it gives me. I like the things it does for me. I require attention. I want to do something sensational. "I'm gonna live. I'm not afraid to try things and I want to live and experience things if it interests me. "I'm not gonna say, 'I could've.' But I'm not out to kill myself either."